You've got four days remaining in which to get your hands on an exclusive Pax Britannia Lego kit that is only available to buy here. 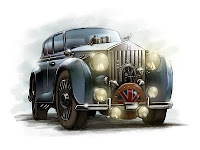 First up is the Mark IV Rolls Royce Silver Phantom from Unnatural History. With a screech of tyres the Silver Phantom hared away along Prince Albert Road leaving a cloud of burnt rubber smoke in its wake, as Ulysses sprinted across the road – men, women and children running screaming in disarray all around him – towards the Overground pillar, and after Jago Kane. Click here to buy your Lego Silver Phantom now!